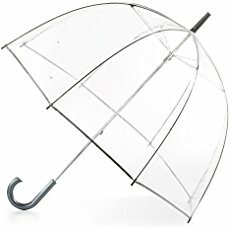 Clear stylish bubble umbrella: waterproof clear canopy for maximum rain coverage and see through visibility. Windproof and rainproof: with 47" dome coverage, you'll be protected from the wind and the rain so hair and clothes stay dry. Lightweight construction: aluminum shaft offers a lightweight design with comfortable acrylic matte silver finish handle. Fashion for special occasions: clean, distinct signature design bubble umbrella is the perfect rain accessory for a wedding, graduation, prom, or everyday city walking.